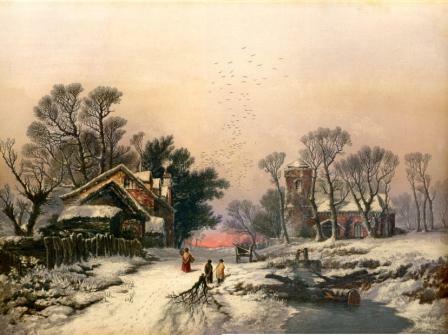 Often called 'Large Winter' this print was published by George Baxter in 1859. Catalogued by Courtney Lewis as CL 368. Baxter Process Print, size 38 x 29 cm. This print is unsigned. It was originally sold for 10s. 6d. Companion print to CL 365 (“Summer”), and after a painting by the same artist, after W. E. Jones. Produced from a steel plate and eight colour blocks. Also printed by Le Blond and Vincent Brooks after Baxter sold the plates when his business closed.